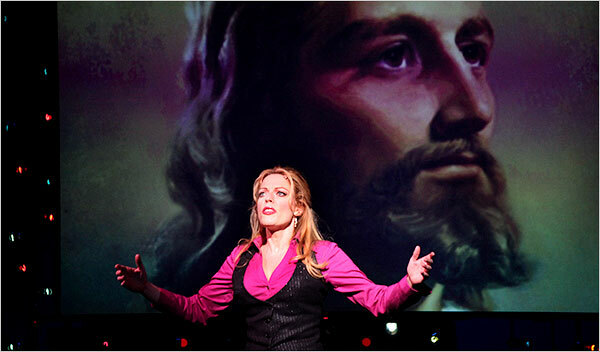 Funny, forthright, bittersweet: none doesn’t quite describe Everyday Rapture, the lovely, not-quite one woman show starring Sherie Rene Scott at the Roundabout’s American Airlines Theater (what whores, the Roundabout, bartering naming rights for such a clunky moniker). Rapture is more than that quintessential show biz tale of a girl who makes it to New York and finds fame on the Great White Way: there are bumps, the kind that forever change your worldview—there’s also religion, mad fan obsessions with Fred Rogers, Judy Garland and Ms. Scott herself—set to tunes by Bono, U2, Elton John and others. It also addresses a dilemma faced by many of us growing up: do we indulge the self (our imaginations, our dreams, no matter how grandiose or improbable) or do we suppress it for the sake of God-fearing humility? Rapture’s exploration of this conundrum is dizzy and down to earth; anchored by Scott’s magnetism, the entire show demonstrates how ideas parlayed on a modest scale can yield bountiful rewards. So immersed was I that, after, walking down the “new 42nd Street,” my heart sank at the sight of dull tourists and the amusement park trimmings that pass for architecture; I wanted nothing so much as to go back inside and have Scott sing me a song or tell me another story. Everyday Rapture—could it be the antidote for civilization? See it and decide for yourself.